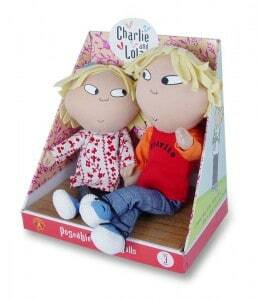 How is it possible that I only recently became aware of the adorable brother and sister duo, Charlie & Lola? 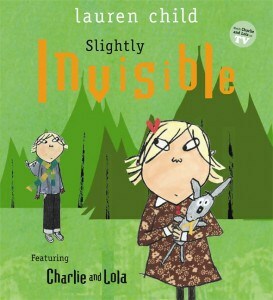 My children and I were captivated by the new Candlewick Press picture book, Slightly Invisible featuring Charlie & Lola by the talented Lauren Child. What really impresses me is that the book is simple yet brilliant as it captures the world (both real and imaginary) of a seven year old boy, Charlie and his four year old little sister, Lola. I see so many universal characteristics of my own young children in this story that it is both charming and humorous. Slightly Invisible follows Charlie & his friend Marv as they invent an invisibility potion to help them find “strange and tricky creatures” and they don’t want Lola tagging along. Not one to sit by on an adventure, Lola enlists help from her invisible friend, Soren Lorensen, a tea set, a rabbit and several glasses of pink milk. Have the “strange and tricky creatures” finally met their match? The illustrations really bring this story to life and I could see my children’s eyes light up as the text and illustrations really stirred their imaginations. Slightly Invisible is a thoroughly enjoyable books for children ages 3 to 6 and I can’t wait to read more Charlie & Lola stories with my little ones. You can learn more about this title or purchase it here. Imagine the excitement in our household when I gathered the kids around the living room for a family movie night screening of the BBC Video Charlie & Lola: the Absolutely Completely Complete Seasons One & Two DVD Boxed Set. We had so much fun watching the first of eight discs showcasing the adorable Charlie & Lola in a series of adventures. This fantastic collection includes a whopping fifty two episodes of this popular show along with a double length Christmas feature. All of my children ages, 3, 4 and 6 love talking about their new “friends” Charlie & Lola. My six year old son’s favorite episode so far has Charlie & Lola making a house for a black house spider. The animation is delightful and the episodes have a warm, friendly vibe. Even my husband thinks it is excellent programming for young children and he is very particular about the shows our kids watch on a regular basis. Charlie & Lola: The Absolutely Completely Complete DVD collection is a huge hit in our home! You can enjoy these episodes in your home too and this box set can be purchased by visiting the BBC Video American Shop online. My 3 year old son and 4 year old daughter have two new friends, the talking, poseable Charlie & Lola play set dolls that they take everywhere and even sleep with at night. These adorable dolls are 12 inches tall (Charlie) and 9.5 inches tall (Lola) and are packaged in a reusable play set. What a fun way to bring Charlie & Lola to “life” for their littlest fans. I love listening to my two children make up their own adventures starring Charlie & Lola. You can learn more about this play set and the talking dolls which are available for purchase for only $25.00 (for the set). I would like interrupting chicken. Looks funny! Ohhhh what a GREAT giveaway!! The dolls have been in my cart on Amazon…waiting to be bought! LOVE Charlie and Lola…oh, I like the other Charlie and Lola books on Candlewick Press! I also like Judy Moody and the NOT Bummer Summer! I think that my daughter would enjoy the book Interrupting Chicken! Would love to win for my granddaughter!!!! The Tale of Despereaux. Loved reading this book and watching the movie.